While Gordon and I have been busy redecorating Ben’s bedroom, the kids have been happily playing in the garden. Yesterday morning while the last bits of plastering were being done I tried again with the paint-bombing. I got some great ideas from people leaving comments on here and on Facebook and I decided to try dropping them from the climbing frame. I also found a sports cap bottle that made filling the balloons much easier too, as the end of the balloon fitted nicely over the spout. We got better results doing it this way that we got on Saturday, but the kids aim still meant that a good few paint-bombs burst on the grass! Thomas was definitely the most accurate and the most successful and he burst most of the balloons himself in the end. I love the final art work we created and in fact I have used some of it in Ben’s new bedroom! 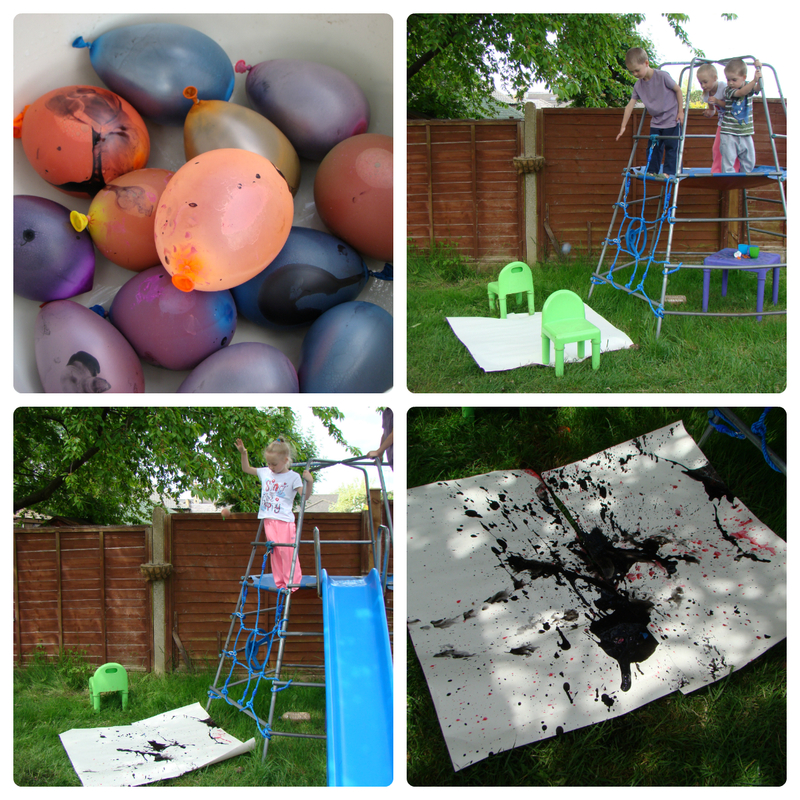 After paint-bombing I had a tray full of black paint that had leaked out when I was filling the balloons. Rather than waste it (or spend a long time trying to get it back in the paint bottle) I decided to use it for some feet painting down the garden. I unrolled some more lining paper as a “road” and the kids stepped into the tray of paint and onto the road! I had also placed a bowl of water at the other end so when they had enough they could wash their feet. When I initially mentioned painting with feet to Thomas he wasn’t sure at all. But he changed his mind as soon as he saw the piece of paper and the water at the end and was first in! Jasmine, who I did think might not join in at all, was straight in after Thomas, closely followed by Ben. They loved it, slipping round the paint tray and running round the paper leaving paint-y footprints. 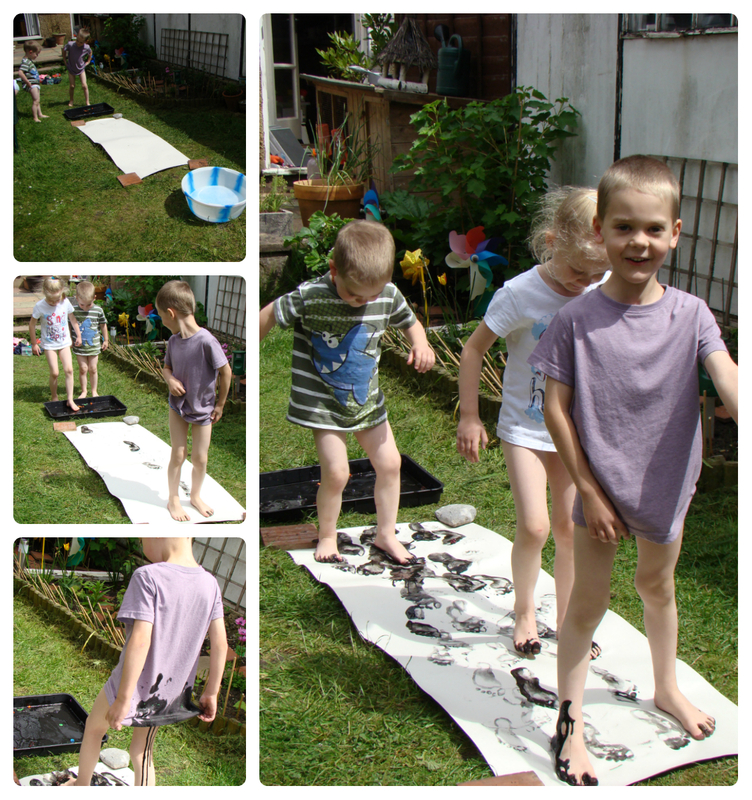 Of course, the paint being slippery meant that the boys fell in and didn’t just end up with paint-y feet! Poor Thomas did end up taking one tumble to many though and the activity ended with him in tears. Hopefully it hasn’t put him off and next time I will put the paint straight on the paper rather than inside a slippery plastic tray! Today we spent the morning in the park with some local twin families. I love meeting up with other twin mums and I had a lovely chat while the kids played. This afternoon they went in the garden again. Jasmine began by finding a spider and insisted on catching it in a jar! Her bug obsession is getting bigger and bigger! I should be happy because it means she can now remove any spiders from near me when Gordon isn’t around, but when she comes and shows me a large spider I am not so keen! I got the water table out for them this afternoon. I also filled up the top of the sandpit with water, coloured some water blue and put this in a bowl and put another large bowl of shaving foam out and told them they could use it as soap to wash their toys. 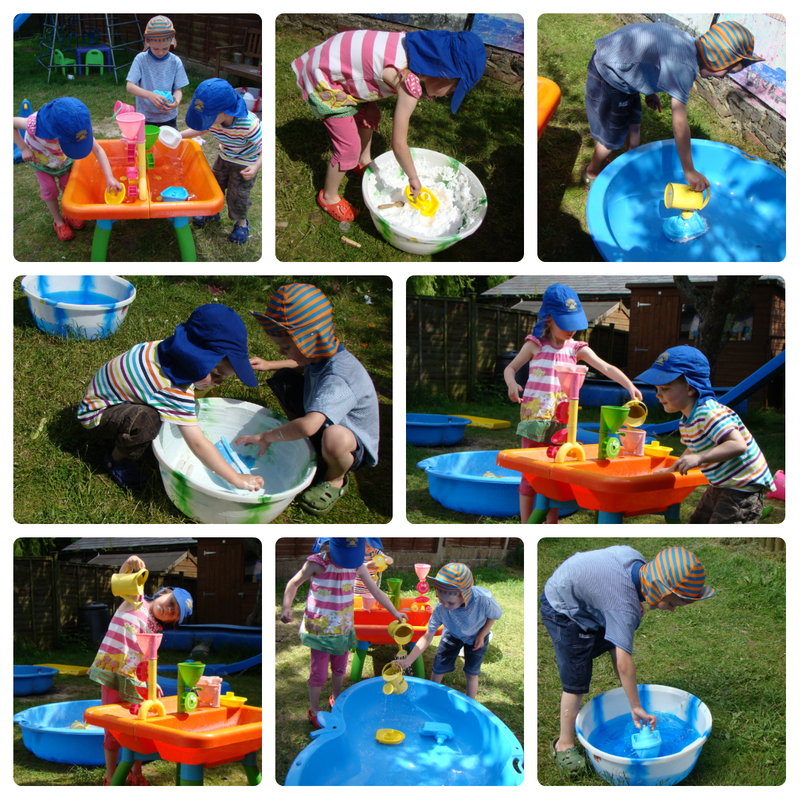 They’ve never been keen on using shaving foam as a messy play material, so I thought that using it with water in this way would encourage them to play with it, knowing they could wash it off with more water at any time. They spent all afternoon playing with the water; washing toys and rinsing them with their watering cans, making whirlpools, visiting the deep blue sea and lots of other things as well. They had a great time, were occupied for ages and were thoroughly soaked by dinner time! We’ve had a great couple of days in the garden and it looks like the sun is going to stick around for another day or so, so I imagine we’ll be out there again over the next few days. I love your paint bombing and foot prints, the garden is such a great place to experiment with paint on a big scale without any worries of the mess indoors. Mine would have been queuing up to try both of these, an activity that keeps the kid in them alive! It is garden play all the way for us too with this wonderful weather. Thank you for linking up to Country Kids and sharing some great ideas.